This little pizzeria by the Brooklyn Bridge has a reputation for serving one of the best pizzas in New York. The coal fired brick oven and the fresh ingredients they use certainly makes their pizza stand out above the rest. Once you take a bite of their pizza, you'll experience the sharp, intense flavor of their tomato sauce and contrasting textures of their thin, crispy, chewy crust. 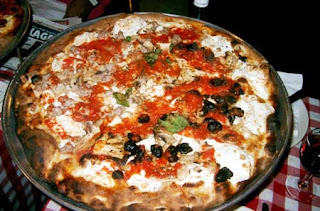 Grimaldi's has been around for decades, and people from all over have been flocking there to enjoy what they have to offer. Every time I go, the wait is at least half an hour. 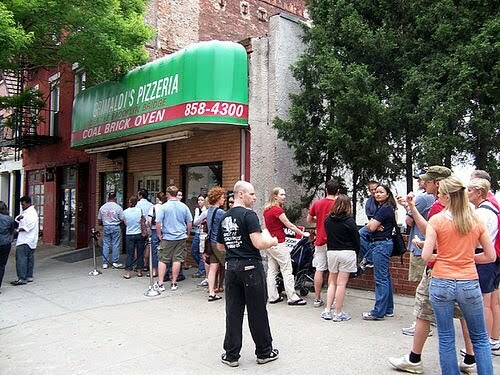 The feeling you have when you're dining at Grimaldi's can be frustrating if you're a first time diner. The combination of waiting on that long line and the fact that you're starving by the time you sit down can certainly exacerbate your experience there. The service isn't exactly the greatest and the place is so cramped, you might knock over a few glasses as you make your way to your table. But let's face it, that hasn't stop people from going back. I've tried deep dish pizza at Chicago and the pizza in New York is still the best. Maybe I'm biased because being a New Yorker, nothing beats thin crust pizza. The only complaint I have to make is that Grimaldi's pizza gets cold and soggy if you don't eat it right away. So eat up fast as soon as it gets to your table. Just a heads up, they serve whole pies only and don't take any credit cards. They have locations all over the US, but definitely try the original right by the Brooklyn Bridge so you can enjoy the view there at night right by the water.